Hello all ! I'm very new here, and new to the world of soundproofing, I spent a lot of days on forum research before posting here and now I just need to cover specifics. Here is a drawing of what the apartment I just moved in looks like, I chose this one in particular because of many reasons, but the most important one being that I intend to make music (jams, record music, mixing projects) and the room that will serve this purpose in not adjacent to any neighbors, downstairs being a business closed on evenings and the outside world + other apartment rooms on other sides. The living room and kitchen are one big room only separated by a little corner. I also intend to throw the occasional party in the living room and enjoy movies with good volume and don't want to disturb the neighbors at night so I will be covering the music room and living room with acoustic panels to attenuate echos, I'm hoping this will help reduce volume in the apartment. 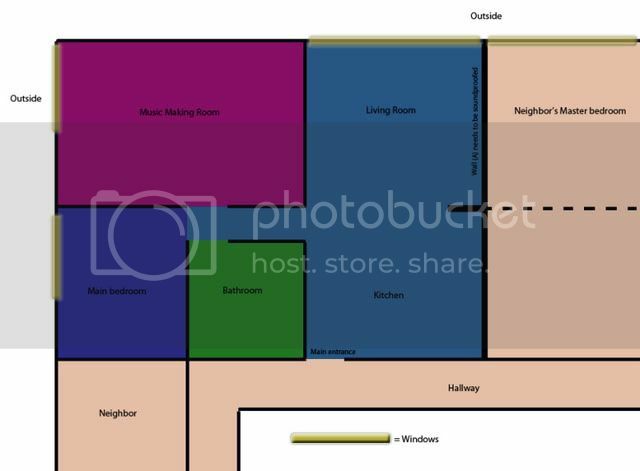 After reading a lot about soundproofing, I realize it will not be enough so I'm considering soundproofing the living room wall (Wall (A)) that is adjacent to the neighbor's bedroom. The windows in the living room extend all the way from one wall to the other, so I only have about 3/4" that I can use to add mass to the wall before getting onto the window frames. I also cannot open the wall and put anything in between the wall studs so I'm hoping there's already something there to help with that. 2 - Since I won't have space left to add any other layer of mass because of the window frames, I thought of covering the entire wall surface with 2" Roxul Rockboard 40 mineral wool and just covering the whole thing with a big blanket, would that help at all ? if so how much worth ? Since I'm mostly concerned with low frequencies, I know rockboard 60 or 80 would be more appropriate, but it is much more expensive, I could go for it if it'd really make the difference but I'm just not sure with the whole concept of a wall of mineral wool, it's the only extra thing I can think of anyway because of the window limitation. 3 - maybe a layer of exposed thin mass loaded vinyl in between the roxul and the new drywall ? (getting really costly now). In summary it'd go like this : sound -> layer of rockboard -> new drywall -> green glue -> old drywall -> whatever's inside with the studs -> neighbor's drywall -> neighbor's bedroom. I would really appreciate any help, so please let me know all your thoughts. -- Sorry about the message spanning on 4 posts, I didn't know about the 1000 words limitation of posts so I chopped it in parts. Also : I understand that complete soundproofing may not be possible with these mesures, but how much will it help is something I'd like to know. This will be your added STC value for the transmission thru the wall...mind you this is only a band-aid approach for sound control..the LF (bass) will still be able to get through this is system with some reduction but not the best reduction because you are not decoupling from the structure. After this is done, than address acoustical conditioning with your 2" roxul rock board mineral wool.